In the comments to my previous post, the subject of Tata's new sponsorship deal with Ferrari cropped up. Although it might seem just another boring commercial announcement regarding F1's ability to draw in new advertising, this one is rather more significant, I think. Tata is a huge Indian truck and car manufacturer that has bought automotive companies around the world, most notably in its acquisition of Jaguar and Land Rover from Ford in 2008. It has adopted a policy of buying manufacturers that are failing and then using the technology so acquired to design new products that come to dominate markets. In this way they have rapidly become leaders in the manufacture of trucks and buses and now are involved in an aggressive expansion into the sedan and sports car markets - hence the Jaguar/Land Rover deal. It is this last that makes the Tata/Ferrari link most interesting. With their plans to attack the European and American markets with specifically-targeted car designs, it makes sense that their promotional strategy should include motor sport. The company has already been involved in F1 through its sponsorship of Narain Karthikeyan (which explains why Force India have never been interested in the Indian driver - there is no love lost between Vijay Mallya and Tata) and so has some understanding of the benefits of F1 sponsorship. Why Ferrari? Well, that might be explained by the fact that Tata has an existing relationship with FIAT and are currently working on the production of a pick-up truck with the Italian company. With F1 already a major promotional tool in Europe and a growing one in India, thanks to the coming Indian GP and Force India's involvement, it seems logical that Tata would use their link with FIAT to gain a foothold in the sport through FIAT's subsidiary, Ferrari. But I do not believe that will be the end of Tata's involvement in the sport. For a new company aiming to break into new markets, the extensive exposure through F1 in those markets must look very tempting; I think we can expect Tata to become involved to the extent of having their own team sooner or later. And it is good news for teams that face the possibility of being sold in the near future. Tata's record of buying companies with existing technology to expand their capabilities means that it would be natural for them to buy a team rather than start from scratch as Toyota did. Dietrich Mateschitz must have really sat up and taken notice when he heard of Tata's deal with Ferrari - it means that he might well be able to sell Toro Rosso before the crunch comes in 2010. That is all speculation, I admit. But it does reinforce what I have been saying for a long time: that new teams entering F1 will not be the usual suggestions like VW/Audi or Porsche, they are far more likely to come from the developing industrial nations such as India and Korea. Such companies are aggressive and growing quickly and will see F1 as a way of getting their brand names known and trusted in a very short space of time. We bemoan (quite rightly) the fact that the traditional circuits of Europe and North America are gradually being phased out of the sport in favor of new tracks in developing nations; but let us not forget that the auto industry has already shifted its center of gravity to the new markets and it makes sense that interest in motor racing in those countries should increase as a result. Tata may be the next Asian entrant to F1, heralding many more, I suspect. I wonder, if they are interested in getting involved, why they didn't jump at the chance to acquire Honda? We've seen that race drivers have troubles coming back from a year lay off. I can only believe that a whole team that has been off for any length of time will have a very steep hill to climb to regain lost ground. Since Honda is already at the bottom it will have a very short shelf life if any. If all was so rosy in Tata/Jaguar/Land Rover's garden, one has to ask why they're in talks with the UK government for financial support to bail out Jaguar. Clive: Wow. Tata heralds a sea change. Really? You make it sound like losing Spa is right around the corner. I'm not disputing your assertions. I'm just surprised. Nick: I don't think Tata would be interested in Honda F1 at this time - it is too early for them. The Ferrari deal indicates interest but not commitment as yet. So Honda will be long gone or already bought by the time Tata looks around for something to buy. Even STR will be lucky if Tata are ready before some sort of decision has to be made by the team regarding its future. Patrick: The reason for Tata's talks with the UK government regarding funding for Jaguar/Land Rover is likely to be that the company is ready to accept investment wherever it can be found. If a government is prepared to assist with one of its local employers' recovery, why not take the money? Judging by its international investments, Tata is not short of a few quid and could easily fund a Jaguar revival - but would prefer it if at least some of the money could be found locally. The Arab countries are a different case, really, having no local car manufacturers to drive interest in F1 and a much smaller market than the Asian giants anyway. To them, having a GP is a matter of national prestige only, I think. Marc: All the more reason to fight for the survival of the traditional circuits, actually. F1 has already reduced the percentage of European circuits on the calendar to less than 50% but it will be a while before the new circuits justify their existence through local fanbases. So there is time for the slack to be made up and, in the meantime, no need for Europe to lose anymore GPs. One must keep the existing fanbase happy, after all. I am talking a much longer timeframe than may have appeared in the post, Marc. Tata is not the first Asian company to have looked at F1 as a promotional tool (we have seen two Japanese teams and three engine suppliers already) but its significance lies in the fact that it comes from a much more recently developed country than Japan. Indian enterprises are growing at a phenomenal rate and there is also a rapidly increasing interest in F1 there. India is leading the way for other strong Asian economies to enter the sport and it is almost inevitable that we will see F1 become even more international in the future. It is supposed to be a world championship, after all. I agree with Patrick that it makes sense to have Grand Prix in nations where interest is developing, but I would hate to see F1 shift its center to Asia. I view F1 as a world competition hosted by Europe, but I wouldn't have been aware of my view on it if this topic hadn't come up. I hate that we lost France and I worry we will lose Hockenheim, but I welcome a Grand Prix in India or any other country who wants to make the investment providing two things: we don't lose Europe as the hub of activity, and that Herman Tilke is barred from designing any more tracks. ... and I dream of Porsche entering F1. If Europe want to retain the perception of " hosting" F1, all they have to do is bow to Ecclestone's whims and pay the outrageous prices to keep the races. The problem with hosting F1 at the moment is that the perception of utter extravagance comes with it and not every population finds this palatable at the moment. In N.Africa the perception of boundless luxury seems to be different. As F1 is now, it is a show for the very rich. As such it can only go over in places that have a system that either dominates the lower classes or is supported by them. In times when money becomes scarce I fear that democratic countries just won't have the acceptable fan base to back F1 anymore. From a marketing standpoint I'm a bit confused about how Tata is going to leverage their partnership with Ferrari. They certainly won't be able to use any of their automobile brands. I doubt Luca will go along with a Jaguar or Rover logo on his cars. And just promoting Tata as a brand doesn't really make any sense to me. I"m probably missing something here, but I just see any synergisim. Perhaps they have other corporate brands that would be appropriate. I really respect your insights Clive, how do you think Tata will take advantage of this relationship? Having just read Ecclestones latest senile and public tirade admitting to fixing F1 from the bottom line (cash) in Ferrari's favour, I will be if anyone would offer to buy Honda or STR. I think if I were in charge of either of these companies, I'd sue Ecclestone and Mosley for millions (at least). Who in their right mind is going to pay a billion dollars to take a run at the prize when they know the game is fixed. 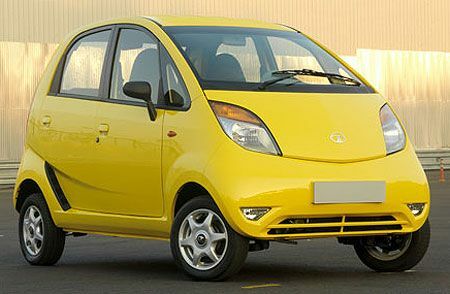 Tata didn't rise to the top of India's auto industry by being idiots. With Ecclestone spewing this type of venom, they must already be wondering about their present investment with Ferrari! Most everyone was aware that Ferrari made a deal with B. Ecclestone to quell the teams breakaway talk. It it looks like he's once again trying to sow disent within the teams. That said, it sure doesn't help the image of the sport. It could well be worth the other teams' while to sue. Bernie said there was only $100m on the table total for early adopters back in February 2005. With Ferrari claiming $400m and there being four other "early adopters", Williams, Force India, Squadra Toro Rosso and ex-Honda are looking at a $60m windfall if they win such a case and the spoils of the incorrectly declared agreement are shared equally. All of those teams would find that particularly beneficial. It's worth saying also that this shouldn't distract the teams from pressing Bernie for more money because the only way the Ferrari/FIA/FOM agreement can legally be annulled before 2012 is by bringing in a new Concorde Agreement that overarchs it. The agreement was subject to a new Concorde Agreement being applied and complied with by the team (oh dear, there goes Squadra Toro Rosso's $60m), so if the new Concorde Agreement forbids such additional payments, then the payment could be removed on the grounds of the undergirding contract being altered by mutual consent. Otherwise the teams are stuck until 2012 at the earliest. However, a new Concorde Agreement means that all other methods of income generation will also be looked at - especially by the five manufacturer teams who were not early adopters and therefore do not stand to gain from suing over Ferrari's benefit. Instead they are free to concentrate on a more egaliterian payment structure and getting more money from CVC to service it. believe this has been there for quite a while. Both Ecclestone and Mosley are guilty of bringing F1 into ill repute. Very true, Nick. The infamous 151c) of the Sporting Regulations. However, the only authorities that rank above the CVC and FIA are the Swiss Court of Arbitration in Lausanne and the civil courts. The Court of Arbitration has proven much too slow and inefficient for this sort of problem resolution and everyone seems to be afraid of calling in the civil courts in case they find something obnoxious under the floorboards of F1. Marc: I was watching when Porsche had a team in F1 the early sixties. They did very well in a short period of time but got out because they felt that sports car racing was more relevant to their brand name. I suspect that they still feel the same way. Don: One has to remember that Tata's relationship is with FIAT, not Ferrari. FIAT is a very big manufacturer that makes trucks and buses as well as cars and this is where the two companies co-operate. Putting a few ads on Ferrari's F1 cars is merely a way to get the Tata name known by using a subsidiary of the FIAT group. It does indicate an awareness of the marketing power of F1, however, and it is this that makes me think Tata may be in the sport as a participant in the future. I assume Tata are simply going to use the Tata name on the Ferraris. They have the Tata Nano which is the cheapest car in the world and they also have a joint venture with FIAT to produce pick ups so I suppose they could use that. TATA are not only the first indigenous car maker in India, but also now the fifth largest steel maker in the world (after the CORUS takeover). They are also present in virtually every business sector you can think of in India all the way till table salt! From what i have heard, TATA plan to display TCS (Tata Consultancy Services, ) logo on the Ferrari cars. TCS is the largest IT & software consulting firm in India ( For those of you who know how big IT industry is in India, you now know how big TCS is!!) and they have been involved with Ferrari F1 team in IT consulting role for the past three years. More importantly than the subject matter discussed here, if this is a UK website, why do you use US English spelling? Is it a way of attracting US readers who otherwise would not understand proper English without the need for subtitles? The one exception is the date of each post and there is nothing I can do about that. The blog is designed by my son, a web designer, and he still lives and works in England. And it was he who chose which date system to use for the posts. OK Clive. Perhaps, like the French, I'm being too sensitive about the pervasiveness of American culture. It was a tongue-in cheek comment anyway and the spelling doesn't detract from my enjoyment of this great site..